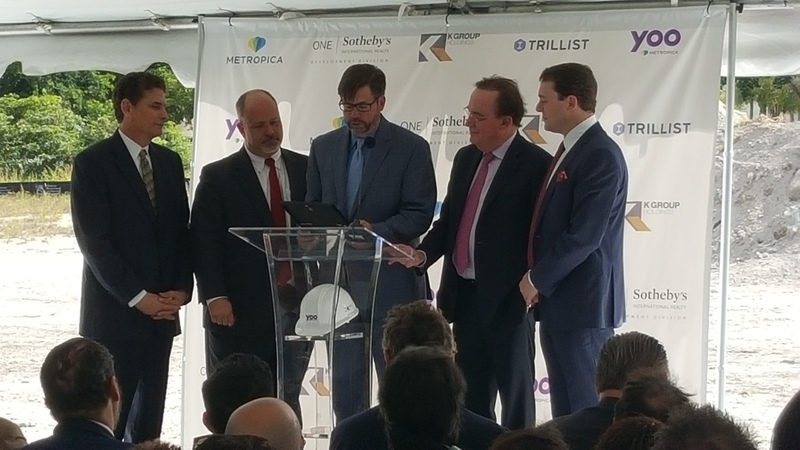 On Tuesday, October 27th, ci design President John Larsen visited Sunrise, Florida to celebrate the ground breaking of the first phase of the 4 million square foot development, Metropica. ci design is serving as master planner of the project, and as architect for the retail, entertainment and mixed-use district. YOO at Metropica will comprise 28-stories, and will boast 263 units and 10 penthouses. This tower will later be joined by a 260-key hotel, 400,00sf of retail and entertainment, and 650,000 sf of office space, designed by ci design, as well as a 2.5-acre public park, recreation fields, and a transit station. Upon completion, Metropica will span 65-acres adjacent to Sawgrass Mills, the BB&T Arena, and the future site of an American Express campus. “This is an exciting step in the development this community. We are proud to be a part of such an innovative project that is truly redefining today’s urban lifestyle,” said ci design President John Larsen. Construction on Tower 1, the first of eight residential towers designed by Philippe Starck and Chad Oppenheim, is set to begin in summer 2015 with an expected completion date in 2017.